World League Wrestling returns to the west side of Missouri as we come back to Richmond! 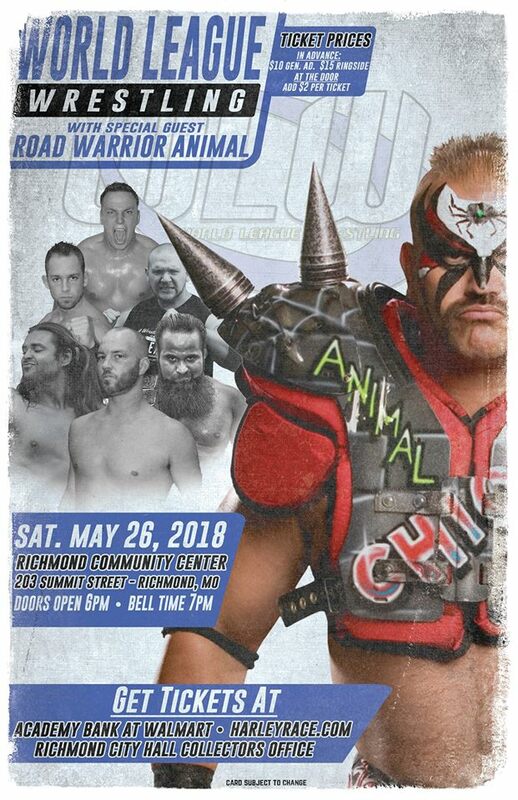 This time, WWE Hall of Fame member and 1/2 of the legendary tag-team Road Warrior Animal will be making a very special guest appearance to this event! This entry was posted on April 23, 2018 at 8:09 pm	and is filed under Uncategorized. Tagged: Brandon Espinosa, Harley Race, Jack Gamble, Jayden Roller, Rex, Road Warrior Animal, Steve Fender, World League Wrestling, WWE Hall of Fame member. You can follow any responses to this entry through the RSS 2.0 feed. You can leave a response, or trackback from your own site.